Before launching into a lengthy history, let me offer in brief form ("a synopsis") the story of what I have found, both in confirmation of the research of others and filling in what they have missed. But first, some caveats and opinions. In the next chapter I'll describe the research of David Talbott and the contribution by Wal Thornhill which have led to the theory of the polar location of Saturn. Before you become flush with indignation at the preposterous claims I will be making in the following paragraphs, consider that I cannot offer the evidence at the same time as the capsule descriptions. Your indulgence is therefore requested. The evidence follows immediately in a terse presentation of some 700,000 words (readable as one chapter a night for a month). Only two jumps are made in the sequence of logical connectivity: an overall base chronology is developed in Appendix A, and most of the detailed plans of celestial interactions are found in Appendix B. That leaves, as the main course, a narrative of the historical events, often separated by many hundreds of years, but more or less in historical order. I hope this will sooth your temper. If I still have your attention at this point, let me rouse your ire once more by proposing that, for example, the Chicxulub crater in the Yucatan is not the mark of the largest bolide ever intercepted by Earth, as is commonly thought. Rather, it is the result of a lightning bolt 110 miles (177 km) in diameter, and not the crater of an object falling from the sky. Yes, lightning bolts can travel millions of miles between planets. Yes, we lost the dinosaurs over the next 10 million years, but the large-scale extinction does not at all conform to the consequences of a fallen rock, as is certainly recognized by the establishment. More on this in a later chapter. The chapters of this site will propose that the biology of our planet, our culture, our psychology, and our very existence, are the result of a series of incidents arising from the interaction between Earth and other planets within the Solar System, most notably Saturn. As hominids, we survived the last externally induced extinction event which gave rise to eight competing sub-species over the course of the last three million years. Our only contribution to our distinction from other animals was the invention 10,000 years ago of language and its subsequent cultural transmission. That set the stage for further development of our "humanity," much later on and much closer to our time: subjective consciousness. It all started very long ago. At one time, and from its genesis, Earth was a planet in orbit around Saturn, a brown dwarf star. Toward the end of the Precambrian (600 million years ago), the Saturnian System intersected with the Solar System. Saturn swept around the Sun, and back into deep space, to return at regular 26- to 27-million-year intervals. Over the course of time, some of the satellites (planets) of Saturn were wrenched from their orbits around Saturn to end up revolving around the Sun instead. The Earth likely became a Solar System planet at the end of the Permian, 250 million years ago. From 600 million years ago Saturn kept entering the Solar System regularly to disturb its lost satellites now circling the Sun. At about 3 million years ago Saturn likely had a run-in with Jupiter, a Solar System planet at that time orbiting the Sun at a distance probably somewhat less than the Earth's orbit today. The orbital period of Saturn was significantly reduced as a result. During this last 3-million-year period Saturn started scavenging its lost satellites, and perhaps Solar System planets, all in orbits close to the Sun. The possibility of a "captured" planet again orbiting Saturn at its equator is virtually nil. Instead, the scavenged planets ended up in suprapolar and subpolar locations, the only locations which seemed to be dynamically stable. Because Saturn had come in from outside of the Solar System, and most likely was a star originally, it would have been at a very high positive charge level -- distinct from the Solar System planets. Solar System planets would have been attracted to Saturn when Saturn entered the Solar System -- rather than be repelled as would be the case of two planets with nearly equal values of charge. Saturn, with its stack of captured planets, was seen by hominids (Homo erectus) and recorded in the shapes of artifacts in the Paleolithic of about two million years ago, and by humans (Homo Sapiens) as carved images in the Upper Paleolithic, from 30,000 BC, and by the hundreds of millions during the early Neolithic, 10,000 to 3000 BC, when the stack of planets was much more frequently seen. At about 10,900 BC, the Earth (at that time a planet of the Sun) made an electric field contact with Saturn, causing 1500 years of "darkness" (shadow) on Earth. The period of darkness is recognized by many of the world's creation myths, and was recorded in the illustrated graphic books of Mesoamerica, references to which are made in Colonial-period documents. Climatologically the period is identified today as the Younger Dryas, when for some 1500 years Earth got as cold as it had ever been. Over the next 7000 years the orbit of Earth, apparently equal to the orbit of Saturn at that time, but below Saturn, progressively moved laterally to have the Earth's orbital path eventually travel below the center of Saturn. Thus, between 10,900 BC and 3147 BC, Earth was part of a strange configuration of stacked planets, a condition which provided long summers and a mild climate in the northern hemisphere. Planets, dominated by the giant form of Saturn, stood above the north horizon and close to Earth (but measured in millions of miles) and were taken by humans to be the Gods who supported them and for whose benefit they labored at agriculture and conducted trade. Initially, during a 1500-year period after 10,900 BC, when the cold of the Younger Dryas set in, and long before Saturn was clearly seen, three fiercely lighted ball plasmoids were seen far south of Earth, below the South Pole. Between about 10,900 BC and 8347 BC, these connected to Saturn in the north via strands of brilliant arcs of electrons. Forms of various shapes ran south over these electron lines, traveling toward the three plasmoids. The moving shapes were taken to be dead animals and dead humans. The objects in the south sky became the basis for all of the original religions (and a good deal of mythology) throughout the world, for they persisted in showing nightly and seasonally over the course of 2500 years (to 8347 BC), although only for three periods of hundreds of years. For the people of Mesoamerica the year 8347 BC, when the last of the plasmoids extinguished after 2500 years, was the end of their first tally of years which accounted for the "first creation." We know only a little about these ball plasmoids from obscure mythological references. And we would still not know very much, if it had not been for an investigation undertaken by a team led by Anthony Peratt (of Los Alamos National Labs) of some 4,000,000 petroglyphs worldwide, carved high up on mountain sides, facing in all directions but always with a clear view toward the south. That study, published in the journal IEEE Transactions on Plasma Science in 2003, was an absolutely astounding revelation. More on that in a later chapter. In 4077 BC Saturn dropped its coma. This had been the "chaos before creation" which had lasted some 7000 years. It had obscured Saturn and its companion satellites. Saturn went nova, it switched to arc mode. In a mass expulsion Saturn produced its rings and a new satellite, Venus (and perhaps another), and Saturn lit up more brilliantly than the Sun. To the humans of Earth, who had not clearly seen the real Sun for thousands of years because of the shadow of the Younger Dryas followed by the obscurity of the enclosing plasmasphere of Saturn, this was the start of creation, the start of time, and the first showing of "the land" and its resident Gods, the satellites of Saturn. Saturn was universally called "the sun" throughout the world. "Like a man was the sun when it showed itself. It showed itself when it was born and remained fixed in the sky like a mirror. Certainly it was not the same sun which we see, it is said in their old tales." In arc mode Saturn would have lost its glow mode coma, but it apparently retained a plasma stream connection to Earth. The Sun (the real Sun) lighted part of the edge of Saturn in a crescent which revolved around Saturn on a daily basis, visually caused by the daily rotation of Earth below Saturn. This stack of planets consisted, from top to bottom, of Uranus (on its side as today) and Neptune, both hidden by Saturn below them (known in Mesoamerica from earlier times). I suspect that these three planets had been seen together for perhaps 2,000,000 years -- initially by Homo erectus. Below Saturn the following were located from top to bottom: Mercury (joined the group in about 14,000 BC), Mars (resident probably since at least 30,000 BC or earlier), and Earth (joined the group after 10,900 BC). In 3147 BC this configuration of standing planets broke apart, with the three large planets moving far away from the Sun, and Earth and Venus released to overlapping "inner" orbits. The breakup produced a stupendous flood of the waters which had been held at the south polar region due to the gravitational attraction of Saturn for some 7000 years. The water held at the South Pole was due to the lifting up of the Earth's crust in the Arctic, and the sinking toward the Earth's interior in Antarctica. Flood stories are ubiquitous, found in over 500 independent "myths" -- all with the same coherent details. The survivors included people far inland, those living already on mountain slopes, and apparently the people of the Nile delta and Northern Mesopotamia. The only recourse to a livelihood for many of the survivors was agriculture, which soon sprang up (simultaneously) in six unconnected regions of Earth. The breakup was caused by Jupiter, which had circled the Sun as an inner planet up to that time. Jupiter was subsequently seen receding in the skies, surrounded by a coma visually three times larger than the diameter of the Moon today. Below the south pole of Jupiter extended a gigantic plasma outpouring, making it look like Jupiter was resting on a mountain (it was green initially). Above the planet were much smaller horn-like extensions. The whole of this looked like a person in a mantle, but was also identified as "the Bull of Heaven." Jupiter was taken as the new God, called "the younger." Jupiter retained its massive lower outpouring until it entered the asteroid belt in about 2860 BC, after which the coma reduced in size and changed its shape. After 3070 BC Mars and Mercury, which had remained in their positions below Saturn, were released when Saturn entered the asteroid belt. The two planets crossed Earth's orbit for about 300 years, overriding the Earth's orbit close to Earth on 30-year (or 15-year) average intervals. At those times Mars was at times brought into plasma contact with Earth, looking like a squat mountain which circled the Earth -- the visual effect of the rotation of the Earth. With Saturn and Jupiter both disappearing into the ecliptic, Mars was held to be the God in charge of Earth, Horus of the Egyptians. This lasted to about 2750 BC or 2700 BC, after which the regular visits of Mars ended, its elliptical orbit perhaps rotating away from Earth (an apsidal precession). In the next century people throughout the world start building pyramids in imitation of the disappeared mountain of Mars, all within a hundred years of each other -- in Egypt, Mesopotamia, England, China, in the Andes of South America, and in many other locations, such as Greece and the Balkans (as has been discovered in recent years, although not validated). We have recorded histories of these celestial events, especially in Mesoamerica. There are accurate descriptions of the rings and the number of satellites of Saturn, the cloud bands and satellites of Jupiter, and the scarred surface and satellites of Mars, all dating from antiquity and spanning cultures worldwide. The Egyptians produced schematic images of the original configuration of Saturn and the satellite planets below, and have a record of early close passes by Mars. Mesopotamians also produced images of planets, graphically showing, for example, all the satellites of Jupiter. The Maya (from Olmec sources) have an undated record of the planetary movements from long before 3147 BC, and a dated record of later events which matches what can be gleaned from Eastern Mediterranean sources. The Aztecs produced graphic images of these planets, although anthropomorphized to gods and produced very late. South Sea islanders have similar records of the rings of Saturn. India has similar recollections of these events extending over millions of lines of poetry. The Quiche Maya Popol Vuh and pages of the Maya Books of the Chilam Balam makes casual references to the period of 13,000 years ago (probably 10,900 BC). One page of the Chilam Balam records seven appearances of the Saturnian planets as far back as perhaps 40,000 years (which can be collated with atmospheric Carbon-14 records dating from 50,000 bp). Over the next 2500 years (3147 BC to 685 BC) the inner planets interfered with Earth at intervals, although very infrequently. There were four major additional incidents. The damage often was localized in latitude, although, for example, a continuous lightning strike might have encircled the globe in circa 1492 BC and certainly repeatedly in the 8th and 7th century BC. The electric contact with Venus turned the equatorial rings blood red and caused the destruction of the rings. Lightning bolts arced up to the rings from the Earth's ionosphere layers and the lower equatorial plasma toroid (the Van Allen belt). The sky bled for three days, and only a single ring remained. Dust continued to rain down for the next 4000 years (until AD 1600). The cleared southern skies, previously obscured by the Earth's rings, revealed a multitude of stars for the first time, most notably the Pleiades, located directly south at midnight two nights after the equinox. The equatorial plasma toroid would have also arced to the surface of Earth, producing months of torrential rains. To humanity, the "sea" of the Earth's equatorial rings in the south sky (the Absu) had collapsed to Earth, and the event was almost everywhere understood as a second flood of stupendous proportion. The Bible recalls this event as the flood of Noah. But to most peoples the blood seen in the sky suggested the wholesale slaughter of humanity, and any number of raging goddesses or dragons were assigned to this event in mythology worldwide -- Kali, Tiamat, Anath, Sekhmet, Hathor, and much later, Beowulf's Grendel. After two and a half days, Jupiter appeared again with its previous giant coma and lower mantle (again understood as a mountain), as if risen from the dead. In fact, the rise of the equatorial (in the sky) made it look as if Jupiter rose up out of the cave previously seen as the shadow of Earth on the rings. The cave-shaped shadow opened up as the Earth regained its normal inclination, and Jupiter rose out of this to a location above it. Jupiter had stopped the dragon from killing additional humans. The event itself remains commemorated as the "Day of the Dead," and is almost universally associated with the culmination of the Pleiades in autumn. Echoes of the fall of the rings and the surrounding circumstances continue to resound in mythology and, to this day, in the theologies and practices of many religions -- especially the resurrection of Jupiter on the third day. Many nations also date the start of all sensible history (and their calendars) from this event. Strangely, this event is simply not noted by any of the catastrophists. Even Velikovsky remained unaware of it. Eight hundred years later, in 1492 BC, Venus again made an electric contact with Earth, causing a crushing repulsive blow in the east Central Pacific. The Pacific islands were wiped clean of any trace of humans, except for the petroglyphs carved on every island thousands of years earlier. Coastal South America and Central America were inundated with water, leaving sea-water traces in lakes high up in the Andes, and possibly causing a sudden rise in the coastal range of the Andes by thousands of feet. The blow was followed by an electric arc traveling through the Pacific, the Indian Ocean, and part of India -- following a path of increasingly higher latitude into the Mediterranean as the Earth's axis angled back toward the Sun. Moses made his escape from Egypt during the turmoil. The event is recalled in mythology as the attack of the monster Typhon who is struck down by Zeus. The major result of the contact was a 30 percent increase in the orbit of the Earth -- the year went from 273 days to 360 days. Venus probably came no closer than 10,000,000 miles (16,000,000 km) in this instance. Another 700 years later (806 BC to 687 BC) Mars closed in on Earth with repeated electric arc contacts at 15-year intervals, a major Earth shock in 747 BC, and a minor shock in 686 BC (this last caused by Mercury). Earlier, Mars had also interfered with Earth in similar fashion at the close of the Early Bronze Age, 1935 BC to circa 1700 BC, which includes the destruction of Sodom and Gomorrah. Mars came close, perhaps to within 40,000 miles (64,000 km) of Earth. The interactions, as a result, were completely different from the long distance shocks due to Venus. The destructions of the 8th and 7th century BC were spread over long stretches from Central Asia to the Western Mediterranean, and through to Mexico and Southern United States. From the Persian plateau to Greece, in swaths measuring more than 600 miles (966 km) wide, hilltop citadels were destroyed by quake-like convulsions much more extensive than any earthquake, and by massive lightning strikes. Cities and citadels were buried under yards of carbonized material mixed with soil. The soil and burned forests were dropped whenever the traveling lightning bolt paused at a hilltop. These simultaneous destructions have been noted in the archaeological record, and include the events of the 8th and 7th century as well as after 1935 BC. De Grazia estimates that only 2.5 percent of the original population of 200 million of the Mediterranean region survived. Bolsena (Volsinii), a city in Italy, was obliterated by a lightning bolt measuring more than 5 miles (8 km) in diameter -- if we are to believe Pliny, who presents this from older Etruscan sources. 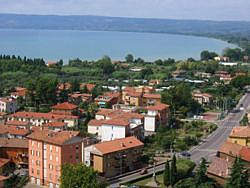 The circular lake at Bolsena is larger than any volcanic caldera. Mars became the next sky God and set a tone for human conduct -- lasting to this day. The destructions of the 8th and 7th century BC obliterated the coastal areas of Greece and coastal Anatolia. The remnant population turned to raiding and became the pirates celebrated in the Iliad and as the Egyptian "People of the Sea." The Iliad reveals that these were no sailors. Warfare and the extraction of tribute also became a way of life for the Assyrians, who plundered from Elam to Egypt. The change in humanity, however, which suddenly brought people up to our current expectations, was an event which happened early in the seventh century BC. In 685 BC Venus and Mercury blazed as bright as the Sun and were seen in the daytime skies with the Sun for forty days starting on June 15. The event was probably an extraordinary plasma outpouring by the Sun, brought on by the sudden relocation of Mercury to within the orbit of Venus in the previous year. In July of 685 BC (actually the astronomical year -685, corrected from 680 BC Julian in Eastern Mediterranean chronology), Jupiter also erupted with a coma in response to the Sun's increased output of plasma, and on July 14 sent a return lightning stroke, a plasmoid bolt, headed for the Sun. It arrived at the Sun on July 25th. The plasmoid, which passed by Earth at a distance of 30,000,000 miles (48,000,000 km), was seen in foreshortened form by Asia and Europe, and is depicted in sculptures and illustrations and even on coins. The Mediterranean nations thought that Venus (or Mercury) was struck -- the bolt from Zeus which toppled Phaethon from the Sun's chariot. As experienced by Earth, the after-effect of the 40 days of extreme solar activity was the relocation of the polar axis from Ursa Major to near Ursa Minor, and the delay of spring by some 15 days (in effect changing the inclination of the polar axis which is equivalent to rotating the dome of the stars). A new equinox was suddenly established. The aphelion of the Earth's orbit (the location furthest from the Sun) changed, and 120 years of interference by Mars and Mercury came to a sudden halt. It appeared to many that Jupiter, the historical supreme God of antiquity, had again saved mankind from destruction. The change in aphelion had resulted in a cessation of further interactions with Mars. In 670 BC the Earth's orbit became nearly circular (for unknown reasons), and the Earth was in fact completely removed from any future interference by any of the inner planets. Within 100 years of this event, we see the simultaneous rise of philosophical studies, much as we understand them today, in China, India, Mesopotamia, Anatolia, North Africa, and Rome -- well before there was any cultural transmission between the more distant regions in this list. It had appeared to many as if a far greater power, beyond the dome of the stars, had moved the stars and planets and restarted the Universe. For many of the philosophers, the causes for natural phenomena were now sought elsewhere than in the whims of the old planetary gods. With the realization of the existence of a power beyond the planets and stars, we also see the sudden rise of all the modern religions within the span of 100 years -- Taoism and Confucianism in China, Jainism, and Buddhism in India (with its subsequent influence on Hinduism), and Zoroastrianism (Mazdaism) in Persia with its influence on Judaism, Mithraism, Christianity, and eventually on Islam. Similar changes seem to be attested to in Mesoamerica, probably dating from after 600 BC. Could all this really have happened? Religions have attempted to explain all of it, initially as narrations of the observed events, eventually as metaphors of spiritual states. Science, on the other hand, has spent the last two hundred years denying that anything at all ever happened. But a look at the histories (what we call myths) of people from regions as diverse as China, Mesopotamia, and Mesoamerica will reveal that they are in complete agreement with each other. Add to these the various myths of the people of India, South America, Africa, Greece, and thousands of others, and a consistent picture of the past emerges, which is not what science tells us. Or fly over the regions of, for example, the Western United States, and you will soon be convinced that the waves of hills, the conical dumps of windborne soil, the distorted folded mountains, and the widely varied landscape cannot possibly be the result of eons of slow movement and metamorphosis of the Earth's crust. The surface of Earth appears to have been battered and wracked convulsively, and recently. the blazing of Venus and Mercury and the thunderbolt of Jupiter which toppled Phaethon in 685 BC. The last few chapters present an excursion into the site plans and iconography of Mesoamerica from about 2000 BC. In these last chapters you will find that the more closely detailed findings from Mesoamerica will match and often exceed the information available from the Eastern Mediterranean. I checked and verified many theories which had been proposed by others about the past. Below I have listed new findings which came out of the attempt to establish a chronology and develop a rational set of mechanics for planetary interactions. Many of these findings have remained unknown (or obscured) to other investigators. Other items listed below are well established, but tend to be avoided or negated by researchers of the catastrophic past. I am offering this list for those readers who are familiar with the major elements of the catastrophic literature of Immanuel Velikovsky and David Talbott. If this is all new to you, skip the rest of this page and proceed to the next chapter. The Earth never turned over -- at least not completely and certainly not permanently. This had been suggested by Velikovsky and others, but is a nearly impossible notion. I dispute this and discuss the origins of these ideas in the Appendix "Polar Relocations Disputed." The age of the Earth, Mars, and the Moon are exactly what they seem to be from the most abundant earliest rocks. The ages do not need to be expanded to fit a theory of the single creation of the whole Solar System, as popular science has done. Details in Appendix A.
Saturn probably first entered the Solar System 600 million years ago, before the Cambrian Explosion. The sudden development of new phyla and species could be attributed to a nova event (and a mass expulsion) of Saturn at that time. All the mass extinctions, and the speciation events which follow these, can be attributed to plasma discharges of Saturn as its orbit repeatedly, and at regular intervals, brought Saturn to an intersection with the Solar System. The excursion through the Solar System would extend over about 15,000 years. This is discussed in the chapter "Nevada Conference." The Permian extinction, 250 million years ago, is the second to last nova event of Saturn, and occurred at a time when Earth was still on an equatorial orbit about Saturn. It did little to advance life on Earth, taking it backward by a hundred million years. But Earth became a Solar System planet after the end of the Permian. The plant forms of Earth testify to the two distinct environments. The glaciation dated 30 million years ago and the intermittent glaciation since 3 million years ago (which can be blamed on electric plasma contacts by Saturn) follow the 27-million year repeating pattern. The rise of hominids in the last three million years is discussed in the chapter "Ice Ages and Humans." The last intermittent glaciations might testify to a series of recent interactions between Earth and Saturn. The mention in many creation myths of a period of darkness preceding creation can be dated to the early Neolithic or late Upper Paleolithic and is likely the result of nanometer dust particles in the stratosphere after a massive compressive force and lightning strikes by Saturn in North America in 10,900 BC. This caused the worldwide period of extreme cold, drought, and darkness, recognized today as the Younger Dryas period. For more on this see the chapters "Tunguska and Chicxulub" and "The Younger Dryas," with additional Mesoamerican retellings in the chapters "The Chilam Balam" and "The Popol Vuh." The cataclysm is addressed in papers by Richard Firestone, et alii, in 2001 (Mammoth Trumpet Magazine), and in 2007 (Proceedings of the National Academy of Sciences). The clouded swirling skies which are found at the start of most creation myths are the result of Earth falling into a subpolar orbit with Saturn and entering the lower part of the coma of Saturn. See the chapter "The Event of the Younger Dryas" for a narrative and a consideration of the dynamics. This also coincided with the start of the Hypsithermal period in 9500 BC (for which see the chapter "A Timeline and Gimbutas"). While traveling through the lower plasma formation of Saturn's coma, the Earth three times experienced the formation of three ball plasmoids 150,000 to 400,000 miles (240,000 to 644,000 km) below the South Pole, with lines of electrons connecting these and running past Earth to an object in the north skies. This started in 10,900 BC, and ended in 8347 BC. The petroglyphs of this condition were investigated by the team led by Anthony Peratt, and published in 2003 and 2007 in the IEEE Transactions on Plasma Science. The dates above are from my findings. The ubiquitous female figurines found in the millions on millions worldwide, dating from the Upper Paleolithic and the Neolithic, are representations of Uranus, Neptune, Saturn, Mercury, and Mars as seen together in the skies on the ecliptic, enclosed in a coma. Discussed in the chapter "A Timeline and Gimbutas." The flood of 3147 BC is correctly identified in the mythology of Sumerian and Bible sources, although shifted to a narrative of 2349 BC. It can be assumed that Jupiter (at that time closer to the Sun) passed Saturn and its planets on the inside of Saturn's orbit. The current orbital inclinations of the outer planets matches the expected vertical separations of the planets in 3147 BC. Discussed in Appendix B. The flood of 3147 BC, which was the world flood, came from the south, as a result of the relaxation of the Earth's crust when Saturn left its location above the Earth. This resulted, among other things, in the debris of the Siwalik hills in northern India, as well as the tropical- and temperate-climate plant and animal remains found in the muck of the North Polar sea. The Palette of Narmer depicts Venus, Mars, and Uranus, where the pharaoh figure is Horus/Mars (and dressed as Saturn) -- not some battle of unification for prehistoric Egypt, and with Mercury as the sandal bearer of the pharaoh. See the Appendix "The Palette of Narmer." The bee and the sedge, as in "He of the Bee and the Sedge," is the pharaoh as Saturn, with Venus as the bee and Uranus as the sedge. See the chapters "The Creation," and "The Start of Time." The raven and dove let out by Noah to test the waters can be identified as the planets Uranus and Venus as seen from Earth directly after 3147 BC. The Mesopotamian flood myths identify the same planets and adds a Swallow -- which is likely the Moon but might be the later Mercury. The report in the Bible and in Mesopotamian legends (and hundreds of additional flood legends) of a ship landing on a mountain after the flood is the backlighted crescent of Jupiter on top of a massive outpouring of plasma from the south pole of Jupiter. In Egypt, as in some Mesopotamian retellings of this event, this is also understood as an approaching celestial bull, which destroyed the city of the Gods. The orbits of the inner planets have changed only minimally since 3147 BC. Most changes involve an apsidal rotation of the second nodal point. Planets have to line up exactly with the Sun to result in an electric field interaction of their plasmaspheres. The biannual sightings of Mars passing close to Earth between 3070 BC and 2750 BC are recorded as events in the dynastic records of the Palermo Stone of Egypt. The few interactions with Venus (which have been presented as "collisions" by others) occurred at distances of 10 to 12 million miles (16 to 19 million km) and 17 to 20 million miles (27 to 32 million km). Electric interactions with Mars occurred at much closer distances as Mars slipped by Earth, but probably no closer than 40,000 miles (64,000 km). Details in various chapters and Appendix B. The orbit of Earth enlarged four times since 3147 BC: in 2349 BC, 2193 BC, 1492 BC, and 747 BC. See Appendix B, "Celestial Mechanics." Each time the Earth reached a different location from the Sun, it needed to adjust its charge level, and plumes of plasma extended up from the magnetic poles, perhaps lasting for years. Both the north and the south plumes, extending up some 10 or 20 Earth diameters, were seen throughout the world. The ends moved with the rotation of the magnetosphere, making them look like they were waving in a wind. The people of Mesoamerica called them trees, with birds sitting on top. Egypt called them braziers releasing plumes of smoke and Mesopotamia called the east and west plumes flags or banners and recorded them in seals and sculptures. Mesoamerica in two instances provides a count of how many times this happened. The plumes were detected by NASA in dark mode plasma in 2009, a year after I had added them to my text. When Jupiter entered the asteroid belt, the mountain form of the lower plasma disappeared. Instead, the plasma from Jupiter's south pole extended directly left and right to the asteroids and curved up further away (Jupiter has a reversed magnetic field). These are the ram horns of Amun-Ra. The form is called the "shen" in Egypt -- a circle on a flat line -- and is depicted as a boat almost everywhere in antiquity. See the chapter "The Career of Jupiter" in chapter 20. Jupiter's coma tripled in size in about 2527 BC as it left the asteroid belt, but lost its coma again by 2438 BC. The coma returned in 2349 BC (the "flood of Noah"), but eventually reduced to the visual size of the Moon. In 2150 BC Jupiter caught on fire and burned up a substantial amount of its atmosphere. When this extinguished, Jupiter reduced in size to that of a star. The Earth had equatorial rings until 2349 BC (like all other planets with a magnetic field), called the "Absu" in Sumer and the "Duat" in Egypt (and the "House of Nine Bushes" in Mesoamerica). The Egyptian "doorway to the other world" is the shadow of Earth cast on the equatorial rings, the Duat. This is discussed in a number of places, first in the chapter "The Absu and Speculation" and in more detail in later chapters. The "flood of Noah" consisted of the sudden removal of the equatorial rings, and was accompanied by severe storms and rains. The Earth was moved to near the Moon in 2349 BC, when the Earth's orbit increased, but the Moon did not fall into a regular orbit shared with Earth until perhaps about 2280 BC. The legendary emperors (gods) of China, Yao and Shun, are Jupiter and the Moon. Likewise for Abraham and Isaac. These two were depicted in Mesopotamia also, on the victory stele of Naram-Sin, the great grandson of Sargon, showing Jupiter with his mountain. The Bible identifies the blazing of Jupiter as the first "Tower of Babel" event. The date is most likely 2150 BC. There was a similar event involving Mercury, much later and thus better remembered, in 686 BC. This last bursting into flame was remembered worldwide, and was also identified with the "Tower of Babel" event -- remembered in the Americas too. The Olmec Long Count calendar was instituted on February 28, 747 BC (astronomical year -747). This is also the first full day of the Babylonian "Era of Nabonassar," and the day before the start of the new Roman calendar. The Olmecs added 2400 Tuns (years of 360 days) to account for the past history in solar years, resulting in a Long Count notation starting at 6.0.0.0.0. This is discussed in the chapter "The Maya Calendar." As a result of instituting the Long Count in 747 BC, the Maya/Olmec creation date of 3147 BC is accurate as the date for the terminal event of the polar alignment of Saturn -- in solar years. Our use of the date of 3114 BC is based on a year of 365.24 days. Later retrocalculations by the Maya used a year of 365.24 days. The Venus Tablets of Ammizaduga are correctly dated to the period of 689 BC to 667 BC (in Eastern Mediterranean chronology). See the chapters "The Tablets of Ammizaduga" and "The Hour of Phaethon." Venus and Mercury blazed like suns in 685 BC (the year corrected from Eastern Mediterranean chronology) for 40 days, as the result of an unprecedented plasma output by the Sun (the Solar Wind), which was brought on by the sudden reduction in the orbit of Mercury in the year previous. This electric event changed the inclination of the Earth's axis, resulting also in moving the equinox by 15 days. A thunderbolt from Jupiter which landed at the Sun on July 25, 685 BC brought the blazing of Venus and Mercury to an end. This is what is recounted in the legend of Phaethon. The calendar dates and intervals are recorded by the Chilam Balam and are celebrated in Mesoamerica with site alignments to the corresponding sunsets, and as New Year's day. In 685 BC the Earth's axis relocated from the center of the pan of Ursa Major to a location nearer Kochab (called "pole star" in ancient sources) in Ursa Minor in a period of 40 days. Discussed in the chapter "The Hour of Phaethon." Before 685 BC, the intersection of the equatorial and the ecliptic was directly below the Pleiades. Thus the Pleiades were seen directly above the rising Sun at the spring equinox. This is attested to worldwide, and matches retrocalculations for the previous location of the Earth's rotational axis. There was no precession of the equinoxes before 747 BC. In 685 BC the equinoxes moved 15 days into the future. This did not change the length of the year, but it changed religious feast days worldwide. The inclination of the Earth's axis assumed the current value of 23.5 degrees. It was 30 degrees before that time. The last part of Book Five of the Sibylline Oracle Books (of AD 115) accurately recounts the changes in the sky in 685 BC. Details can be found in the chapter "Sibylline Star Wars." The alignments of ceremonial centers with distant volcanoes in the Olmec region and the Valley of Mexico accurately recall the calendar dates (the horizon locations of the setting Sun) of the catastrophic events of 3147 BC, 2349 BC, 1492 BC, 747 BC, and the axial change of 685 BC. See the chapter "Olmec Site Alignments." I write mostly from memory and do not always get things right. If you find errors, let me know. Questions and differing interpretations are also welcomed. Especially questions. If something is not clear, I need to know, so it can be corrected. I type in a hurry and my word editor is way behind. My e-mail address can be found at the bottom of this page. Tell me which chapter (and revision number) you are reading. But even the mention of a single word will help. I can find the instances (or misspellings) of a word among all 700,000 words of these 41 text files in under a half second. The "Table of Contents" (a link at the top of this webpage) outlines the narrative and lists the subjects covered by each chapter. There are thirty-four chapters, and 17 appendixes. Many chapters are quite short. Everything can be read in 40 or 50 hours. The narrative text can be searched for key words. See the Table of Contents page for a search link. There is also a list of books and links pertaining to the Saturnian Theories. This site currently includes a collection of 7000 mirrored files lifted from the web, sorted into 180 topics. The collection can be searched with another search script located also at the Table of Contents page. Since May 2015, complete book editions of this text are available on line as PDF, EPUB, and MOBI (Kindle) files. I'm indebted to Kees Cook for the conversion scripts. Since 2016 the text is also available as a printed on-demand book in three volumes from the [ebooks page] or from Amazon.com. As a last note: You may want to skip the first introductory chapters, like Chapter 3, which covers how the polar alignment developed, Chapter 4, which presents a further set of postulates, Chapter 5, which offers the Earth's equatorial rings and discusses dogma and speculation, and Chapter 6, which outlines alternative cosmologies, pictures the scale of the present Solar System, and suggests the foundations for life on Earth. Skip this boring stuff and start directly with Chapter 7 (ice ages, Homo erectus and his Acheulean Hand Axe) or Chapter 8 (Tunguska, Chicxulub, and the Great Lakes atomic detonation). The following sites retain a semblance of sanity, express a deep need to investigate, and exhibit considerable creative thinking. [plasmacosmology.net] A narrative description, including some catastrophism and mythology. A very extensive site, written in a summary, easy to read style. The mythology follows Dave Talbott's mostly. [plasmaresources.com] A site equal in scope and general interest, run by David Smith. The inclination is mostly toward space science. No mythology. [sites.google.com/site/cosmologyquest/default] A very readable overview of cosmology and plasma theory which generally cuts across the handed-down science. Includes a mythology section. By Michael Suede. [knowledge.co.uk/sis] Society for Interdisciplinary Studies (SIS) site -- the classic site for continued attempts at straightening out the chronology of the Middle East which was first questioned by Velikovsky in the 50s and 60s. Also largely concerned with catastrophism, but almost entirely based on fugitive comets. Some mythology. [plasma-universe.com] An extensive collection on plasma theory, developed and maintained as a Wiki site by Ian Tresman of the SIS. No mythology. [holoscience.com] Holoscience, Wal Thornhill's site -- plasma theories at planetary and galactic levels and experimental work applied to the Saturnian Theory. Working in concert with Talbott (see "Thunderbolts" below). A very reductive mythology. [velikovsky.info] The "Velikovsky Encyclopedia" is a recent endeavor (2009) to provide resources related to the writings and ideas of Immanuel Velikovsky -- under the unique premise that both sides of the "controversy" could be presented (which in effect will go to prove Velikovsky's case). The authors and archivists write under a thin veneer of anonymity. An interesting tangle of pros and cons. [aeonjournal.com] Aeon (magazine) site -- a promotion of the Saturn Theory; started by David Talbott. Editors: Ev Cochrane and Dwardu Cardona. Cardona is an imaginative and convincing writer. Cochrane is a tireless researcher. This site periodically disappears off the map. Standing still since 2005. [othergroup.net/thoth] Thoth Newsletter from the Kronia.com site -- which was a standard in promoting the Saturnian Polar Configuration. Kronia.com was discontinued in 2010. But the complete set of the Internet publication Thoth can be retrieved from here (and two other locations). [kronos-press.com] Kronos Press -- Books; and a number of articles by Ralph Juergens originally published in Kronos Magazine (and Pensee). [thunderbolts.info] The parent site to the current endeavors of Dave Talbott and friends. A "picture of the day" feature which always amazes, plus an archive. Collected essays by other people. Promos for recent books and book series. Videos are also available on line (plus DVDs for sale). Connection to a wide-ranging forum on matters of "plasma and electricity in space." No mythology. [mikamar.biz] A clearinghouse for books on the Polar Configuration and Velikovskian matters, or, as they say "Products supporting Prehistoric Reconstruction and Plasma Cosmology," and including used books. A valuable resource. Books, but no placed texts on mythology. [science-frontiers.com] "Strange Science, Bizarre Biophysics, Anomalous Astronomy" -- from the pages of the world's scientific journals -- always interesting reading. No mythology. [maverickscience.com] Ev Cochrane's website (editor at Aeon). Includes some of his outstanding articles. Mythology! [catastrophism.com] Actually a CDROM offering of past literature on the subject. And since 2008 offers some some articles and books. [varchive.org] The Velikovsky archive of unpublished documents by Jan Sammer. Mythology. [mythopedia.info] Marinas van der Sluijs's Mythopedia -- originally based entirely on the image and story evidence of the Polar Configuration, but now given over to mythology explained as auroras. Very professional, very verbose, very physically inaccurate, and offered as a book (or books) in progress. [bearfabrique.org] Ted Holden's site which discusses the improbability of dinosaurs being able to move and live with the gravity we experience today. Nice article on the flight capabilities of prehistoric birds. Large collection of other source material in mythology. A few political items. [grazian-archive.com] Alfred de Grazia's writings. Everything is in PDF as complete books or in HTML. Absolutely outstanding! Chaos and Creation more or less (more less than more) parallels these pages. Of great interest, and totally engaging, is God's Fire. This is the story of Moses and the Exodus (1500 BC). Among other things, he reviews works by every biographer of Moses since antiquity, the operation of the Ark, the organization of the camps, the details of the whole migration, the electrical tricks of Moses, his interaction with Yahweh, and the character and psychology of Moses. See also his The Burning of Troy and The Disastrous Love Affair of Moon and Mars. [gks.uk.com] It stands for "God-King Scenario" and promotes the book An Ancient World in Chaos (2008) by Gary Gilligan with offers for two additional books. An analysis of Egyptian iconography, refreshingly direct and unpretentious, which assigns the Gods of Egypt to the known planets and Hathor to an equatorial ring system. Mythology. [saturnian.org] Saturnian Org. Standing still for a decade -- broken links and a few papers posted. [creationism.org/patten/PattenMarsEarthWars] Donald W. Patten and Samuel R. Windsor The Mars-Earth Wars (1996). An excellent interpretation of the destructive record of Mars in the 8th and 7th century BC. It is mythology, geography, and celestial mechanics. [firmament-chaos.com] John Ackerman (as "Angiras") Firmament: Recent Catastrophic History of the Earth (1996), Chaos: A New Solar System Paradigm (2000), and Pelah (2006) establishes the repeated meetings of Earth and Mars (and Venus) primarily from Vedic sources. Ackerman is a physicist. [everythingselectric.com] "In the theme of an Electric Universe. If the information you seek doesn't exist within these pages, then it probably doesn't exist" says Gary Gilligan. A mythology thread started 2010. [www.electricuniverse.info] "Highlights the importance of electricity throughout the Universe. It is based on the recognition of existing natural electric phenomena (e.g., lightning, Saint Elmo's Fire), and the known properties of plasmas (ionized "gases") which make up 99% of the visible universe, and react strongly to electro-magnetic fields." A Wiki site; an attempt at universal information. No mythology. [sites.google.com/site/dragonstormproject] "Recent impact evidence in the Americas. Extensive, map-based graphics." By Dennis Cox. I may not agree with the physics of many of the cosmologically and catastrophically oriented sites, but their varied interpretation of past events ought to be taken into consideration. The sites (or books) of Patten and Windsor (Mars-Earth wars), John Ackerman (Firmament), Gary Gilligan (An Ancient World in Chaos), and Alfred de Grazia (many well-written on-line books) are independent attempts at postulating cosmologies. They are independent from the current fad of presenting electricity and plasma on a cosmic scale, which offers nice images but no clear path for a history of Earth. Besides these there are two dozen books (not listed here) which blame any and all catastrophes on cometary impacts despite the fact that we have no evidence that meteors have ever done much of anything to the surface or climate of Earth. 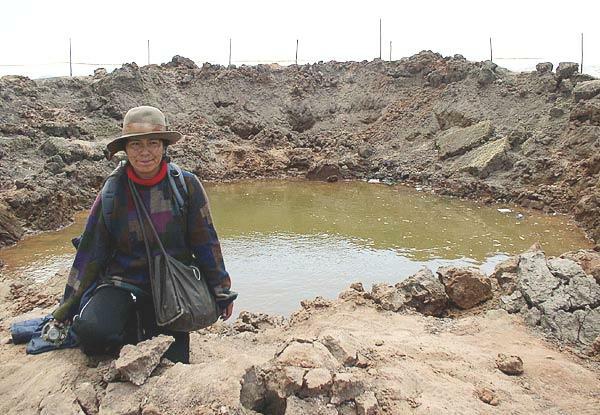 The September 15, 2007, impact in Carancas, Peru, resulting in a 45 foot diameter crater, was caused by a chondrite (stony) meteorite 10 feet in diameter. In theory, it should have delivered as much energy as an atomic bomb with an explosive energy of 15-kiloton equivalent of TNT -- enough to destroy New York City -- but there was only smoke and steaming groundwater. People walked over from nearby to have a look. The principles of panspermia would claim that life is universal throughout the galaxy, and likely throughout the Universe. This is based on the enormous complexity of cells and their DNA, and also on the fact that so-called 'junk DNA' occurs in almost all plants and animals, and represents a large percentage (80 to 90 percent) of the DNA of complex animals (and plants). The date, 2349 BC, as with other dates in the text, was established by medieval and 16th-century chronographers, and seems to be well supported from other data not available to them (such as Mesoamerican written records), as is true for other dates I have used. See Appendix A, "Notes on Chronology." Date estimates in the Upper Paleolithic and Neolithic were developed from the iconography of figurines in Europe and Anatolia, supported by sequencing of these forms by others, and from corresponding climate data. See the chapter "Saturn and Archaeology." Some people never achieve subjective consciousness, yet they appear fully functional. Pre-subjectively-conscious people are almost completely indistinguishable from subjectively conscious people. Pre-subjectively-conscious people can learn anything, including mathematics, and certainly they can joke, have emotions, and carry on convoluted dialogues with others. However, they rely heavily on the learned admonitions of parents and authority figures ("oughts" and "shoulds") and have difficulty with novel situations. Pre-subjectively-conscious humans also do not have the ability to imagine the reflective thinking of others, that is, how others might imagine them as thinking. "Julian Jaynes saw bicamerality as primarily a metaphor. He used governmental bicameralism to describe a mental state in which the experiences and memories of the right hemisphere of the brain are transmitted to the left hemisphere via auditory hallucinations. The metaphor is based on the idea of lateralization of brain function although each half of a normal human brain is constantly communicating with the other through the corpus callosum. The metaphor is not meant to imply that the two halves of the bicameral brain were "cut off" from each other but that the bicameral mind was experienced as a different, non-conscious mental schema wherein volition in the face of novel stimuli was mediated through a linguistic control mechanism and experienced as auditory verbal hallucinations." The concepts are more fully developed ad passim in later chapters. It's not a metaphor, by the way. The left brain is unaware of the activity of the right brain. Day of the month dates for the events of 685 BC are accurately recorded in the 16th-century AD Maya Chilam Balam as intervals. Knowing the terminal date from other sources, the starting date can be found as well as dates of intermediate events. In addition, the Chilam Balam provides "proof" intervals to make its claims, and even lists the European Julian year for the event (as a Tun year). See the chapters "The Maya Calendar," "The Chilam Balam books," and "The Olmec Record." The hour can be pinpointed from an Australian native legend, as well as from the Northern European epic Beowulf. Special thanks to M Signatur for suggesting the expanded synopsis. Special thanks to K Cook for the HTML to PDF conversion script. Size of this page: 10251 words.